Looking for something interesting to do this evening? An Art Opening just around the corner from me looks good. Everybody knows that openings aren't the best time to view art because of the distractions. The distractions on the other hand can be worth the fuss. In this case, the art is housed in a small Tango cafe owned by William Duvall. Aside from the potential to meet long legged women, there's the chance to rub elbows with Robert Duvall who just happens to be the proprietor's uncle. Incidentally this makes the second establishment in a two block radius of my house to be managed -to some extent- by the relative of a Hollywood star (George Wendt's sister bartends at a nearby Italian restaurant). You might even get something out of the art since the body of work is small and the space intimate. 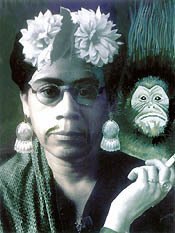 More on the artist Marcos Raya (pictured here as Frida Kahlo). Where are all my black friends?